Exhibition room. Number of the collection about 500 articles. Exhibiting the museum’s own, original documents, recorded through about two-year-long surveys since March 11th. 2011. 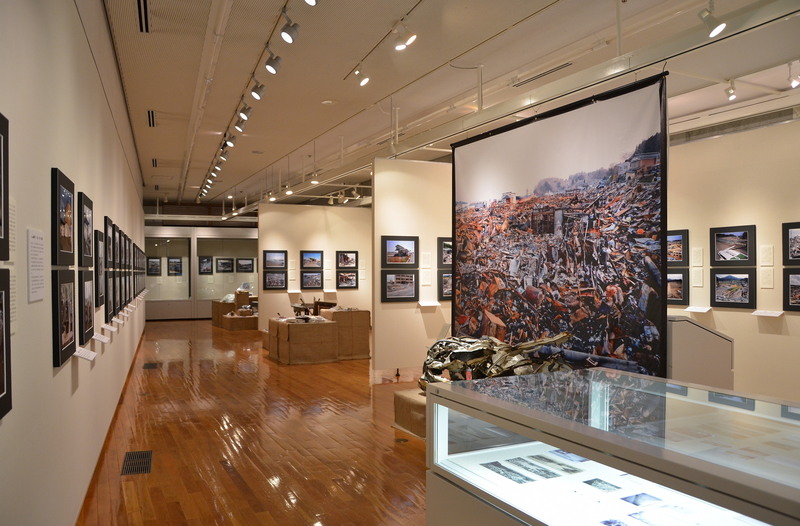 The exhibition includes 203 pictures taken and 155 articles collected, by museum curators themselves at the disaster sites, 137 historical documents, as well as documents to think about East Japan Earthquake and Tsunami from various perspectives, such as history and culture of disaster. ○To document and conduct the research on the situation of the damages caused by East Japan Earthquake and Tsunami at Kesennuma City and Minami Sanriku Town, and also, to summarize the lessons from that for practical and effective use in the recovery and resurgence efforts. ○To compile the damages caused by East Japan Earthquake and Tsunami, as a resource for the development of learning materials for Education for Natural Disaster Preparedness and Reduction for possible future earthquake and tsunami. We, the curators of the museum led the task force for two years in order to carry out the tasks described above. Immediately after the occurrence of the earthquake and tsunami, Rias Ark Museum started making an inclusive survey and kept a record of the damages caused by the disaster. Our team took about 30,000 pictures, and collected almost 250 damaged articles. Also, they compiled tremendous amount of documentary records as the result of the survey. On April 3, 2013, Rias Ark Museum opened a permanent exhibit to display “the essence” selected out of the enormous amount of material obtained so far. This exhibition focused on the idea of “how to present East Japan Earthquake and Tsunami and how to pass it down to the next generation in the region”. We made the effort to interpret the disaster appropriately in the presentation. The exhibition includes 203 pictures taken and 155 articles collected, by the museum curators ourselves at the disaster sites, as well as 137 historical documents. The anterior half is a “Report from Devastated Sites”, showcasing diverse situations after the disasters. The latter half is organized into four themes, “Feelings of Disaster Victims”, “Lost Things･Stuff”, “In Preparation for What Might Come Next”, and “Causal Relationships Between History and Damage of Our Community”. The captions next to the pictures portray what we felt and/or thought when we were taking the pictures at the disaster sites. The tsunami debris exhibited is categorized into two types: (1) debris, that shows obvious physical destructive power, such as the devastating force of the tsunami and the intensity of the associated fire (2) debris such as household utensils to epitomize everyday life lost in the disaster and debris that reminds people of memories of everyday life before the disaster. At the catastrophic disaster site, we felt that various household utensils piled up all around us were telling us something. We gathered the messages from the stuff and made them into short stories of attachment each owner might have had to them and put them up to the damaged articles, hoping our visitors to share the stories between individual articles and their former owners. 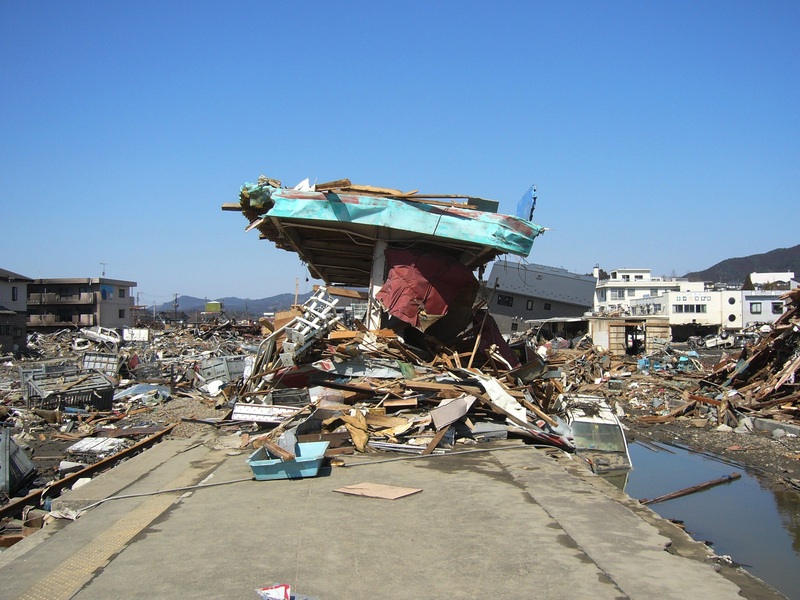 During two years after the East Japan Earthquake and Tsunami, we acquired new knowledge as a result of living in disaster-affected areas, and we also learned propositions and issues while conducting the survey. We exhibit these concerns as “Keywords to Think about East Japan Earthquake and Tsunami” side by side throughout the whole exhibitions. We dare to exhibit the outcome of the survey this way because it makes us feel as though we are still living in the middle of the disaster, and we concluded it is not the time to make a definitive statement. We apologize in advance for an intricate exhibition with a lot of information. We would appreciate your understanding of our intentions. We hope this exhibition will provide you the opportunity to take time to think about the whole issue deeply and widely. Perhaps, to reflect on the past experience is to think over the future. Why was the damage that catastrophic? What should we think from now on regarding what we experienced? Rias Ark Museum would like to share that challenge with you and play a role in the reconstruction and development of our community for our future. We would be grateful if more people would see this exhibition regardless of ages or regions where they are from. Finally, we would like to pray for the repose of those who lost their lives in the disaster. And we wish every disaster victim, a brighter future ahead. Rias Ark Museum of Art is the museum, which introduces modern art, but also has permanent exhibits of history and folklore to diffuse local livelihood culture. Basic principle of the museum is to research and exhibit the arts mainly in Tohoku and Hokkaido region. At the same time, the museum researches, cumulates, and exhibits local culture of these regions, focusing on fishery village and cuisine. Since its opening, the museum intended to research on local culture. We regarded phenomenon of tsunami is also part of cultural events, important elements to form regional culture in Sanriku Coast. Therefore, the museum acknowledges the mission to research and record continuously the damage of East Japan Earthquake and Tsunami, as well as to pass them as local cultural memories down to generations. The incident of East Japan Earthquake and Tsunami will continue combined with a lot of social challenges. This exhibition is shown permanently to prevent these challenges being forgotten in the process of reconstruction. 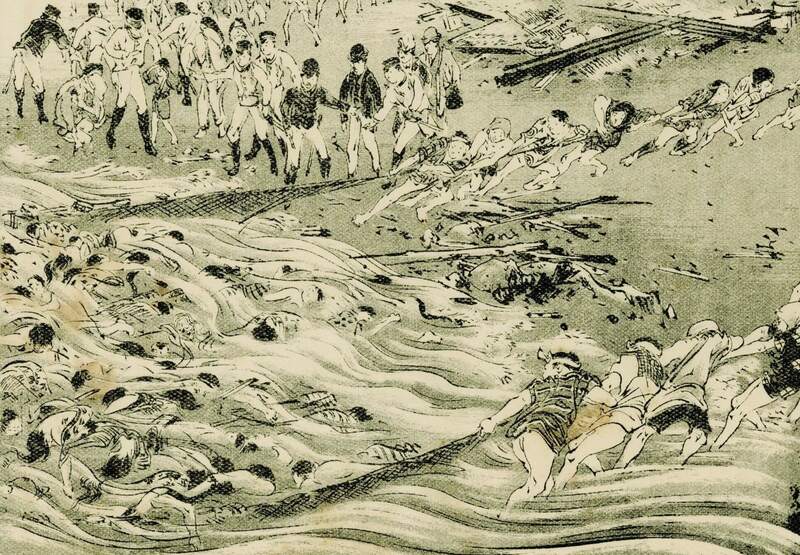 The background of repeating tsunami disasters in areas is deeply related to the history and culture of the community. 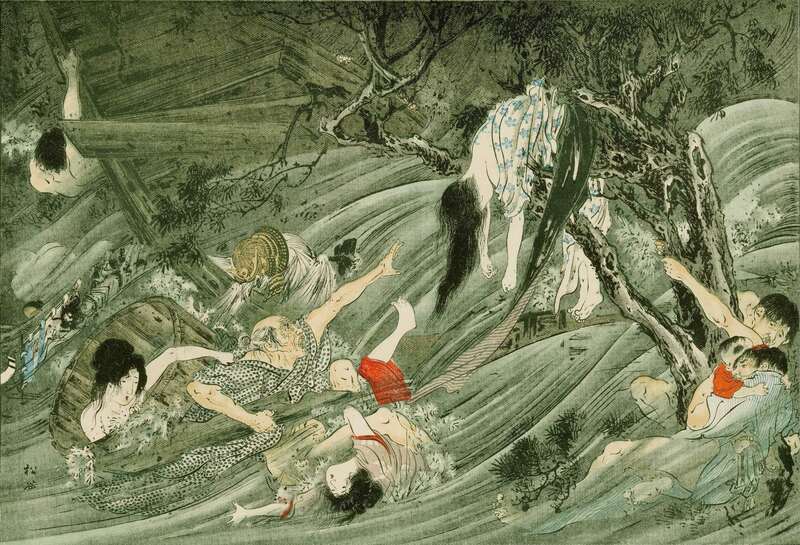 Therefore, the museum tries to talk about the importance to recognize that tsunami is human-generated disaster, which a disaster scale depends on cultural factors in the community. The museum does not regard tsunami disaster as a simple natural disaster of external factor. The museum started the recording survey independently by itself at the moment of the incident. After March 23rd. 2011, it got a special mission of recording disaster damage and surveying in Kesennuma City and Minami-Sanriku Town and carried them out until December 31st. 2012. The purpose of the mission is not just recording disaster damage, but recording the final appearance of the community, which was established by then, to restore community for the future. Curators of this museum while recording and surveying. It was difficult to walk around at the tsunami-devastated area covered by debris, sludge, and heavy oil. The area was terrible environment with breath less bad odor, dust and flies like snowstorm. In the present, people in the disaster area hope to save “record” and “memory” of the disaster as well as before and after the disaster, and trying to become them evident. “Record as objective facts” already exist as enormous audio-visual materials. However, it seems “memories as subjective facts” still exist in the people; most of them are not yet expressed. 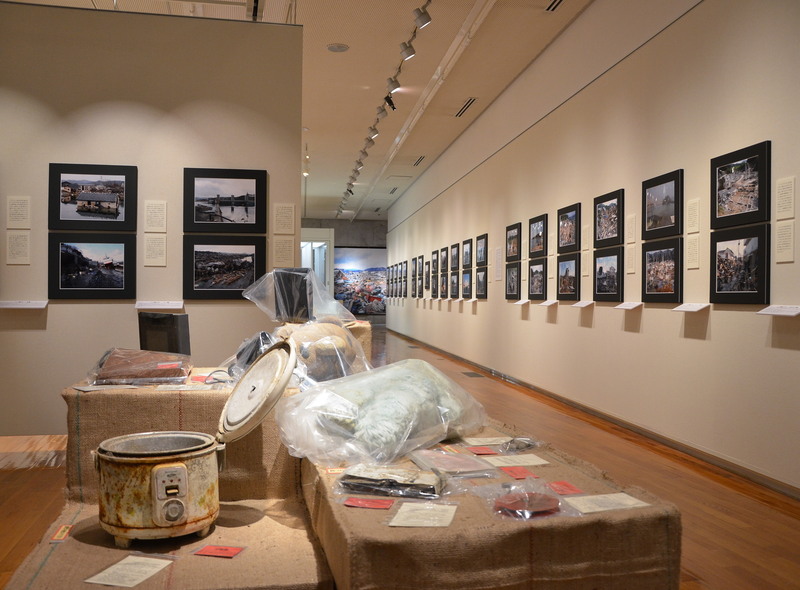 The museum regards the permanent exhibit “East Japan Earthquake and Tsunami” as “trigger” to bring the memories of disaster out to express them. We hope the exhibit to be the place not just to see the material, but the place to bring your own “memories of the disaster” out and to express with each other. 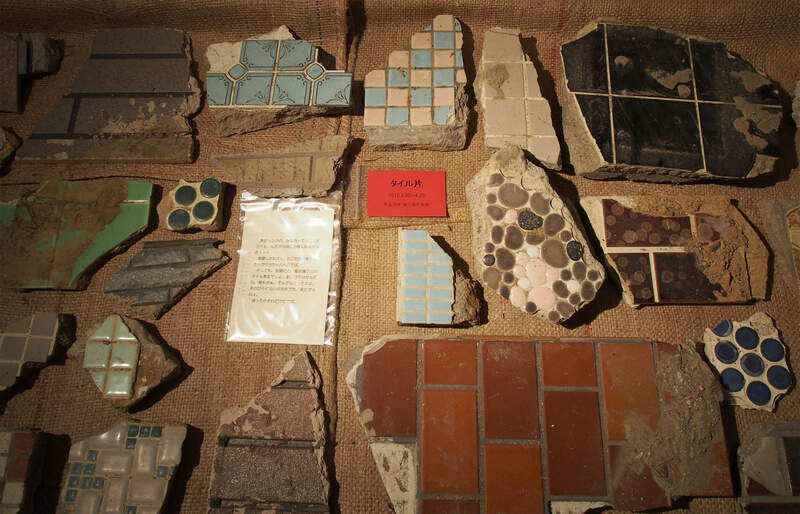 The museum believes that tsunami devastated every tangible material, but it did not devastate everyone’s memories. However, as time goes by, it eventually disappears as the opportunities to remember are lost, and as memories fade. The museum believes that it is necessary to save the media that trigger remembering the memories of disaster victims and to provide opportunities to see them. They have important functions in the process to restore the culture. The museum exhibits photographs of the disaster site and debris as the media to function as the switch to play back memories. The photographers of these pictures, curators, know the disaster site through the five physical senses. A high value is placed in communicating the sense, feeling, or consciousness of those people who stood at the site and went through the experience. Each picture was taken with thoughts and intensions to communicate through it. With the hope that visitors understand them, the photographer himself wrote report for each picture of the disaster site and attached it to the picture. March 13, 2011 Situation at Uoichiba-mae, Kesennuma City. There is the deposition of debris, which makes it difficult to walk, and the smoke also comes up here and there. The wind blows every now and then and ripples the galvanized sheet metals of wrecked houses. The sound that we had never heard, like “Balalaan….Kalalaan”, was coming from every direction. Other than that sound, only wind noise of a helicopter from midair. There are no words that come to my mind. 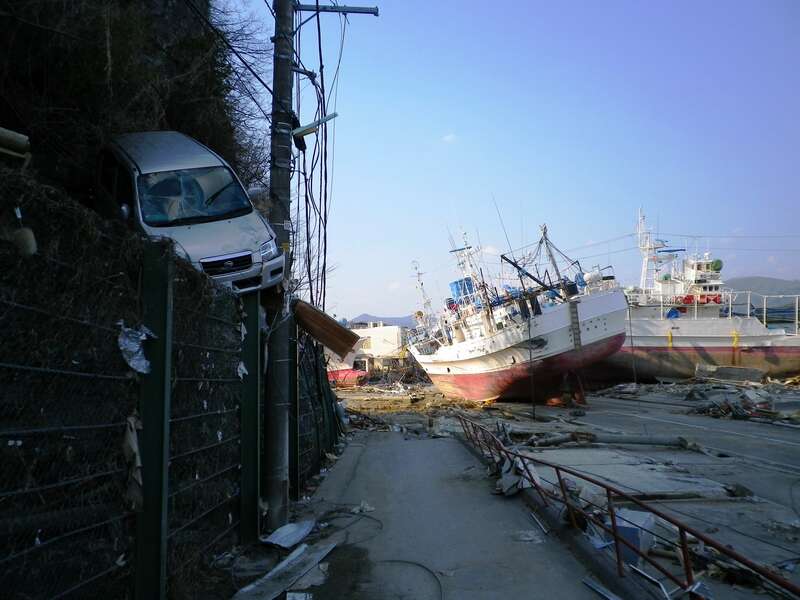 March 29, 2011, Situation at Shishiori district, Hama-cho, Kesennuma City. While walking in the tsunami disaster site, my brain stops as I face the scenes and images of abnormalities. For a brief second, a strangely infantile thought comes upon my mind and I cannot think logically. I feel like this is a trick by a giant. In fact, the absolutely messed up scene continues endlessly. April 5, 2011 Situation at Nakamachi, Kesennuma City. The platform of the JR Minami-Kesennuma station. The JR Kesennuma Line was an important and essential public transportation route for people in Kesennuma who travel to Sendai. Especially for elderly and students, it was everyday transportation. On the weekend, they took a direct train to Sendai, commonly called the “shopping train”, leaving sometime close to 8am, and coming back by the train, which left Sendai close to 5pm. Dressed up young people got off from the train with shopping bags from clothing retailers. Debris means stuff damaged by the disaster. In general, debris is called rubble, but the museum does not think that is right expression. The word ”rubble” means broken pieces of slate, brick. 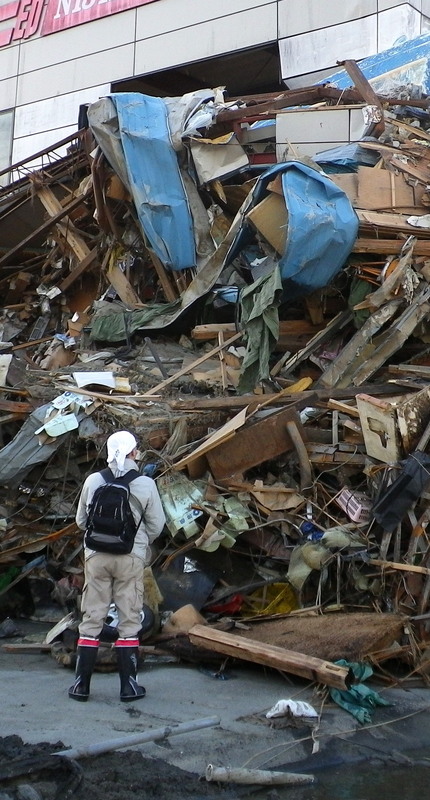 It can also mean “something worthless.” For victims of the East Japan Earthquake and Tsunami, there is nothing we may call “rubble.” They are the remnants of one’s precious house, which are devastated and taken away from us, and assets that were dear to us. They carry precious memories of our lives. With respect to exhibit debris, the museum applies the methods, which are normally do not use to exhibit in the museum. Each debris item has a caption, with the place and the date that are collected on red-colored card. 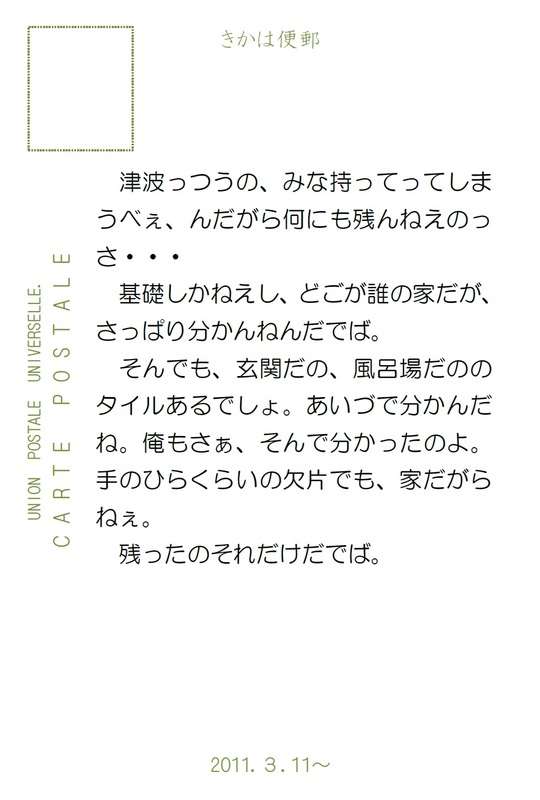 Also supporting material, stories on postcards, are attached to each of them. 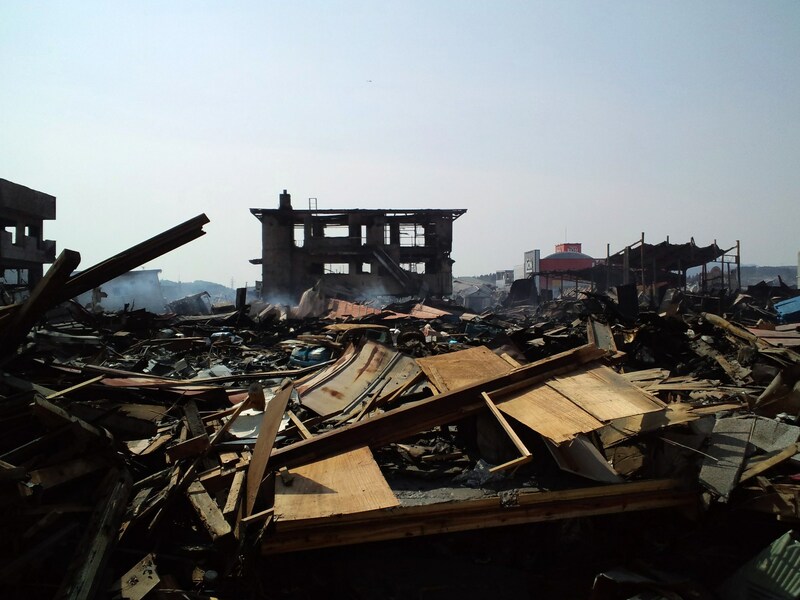 The supporting materials, which are written in spoken language of local dialect, are not records of disaster victims. The tsunami, it just picks things up and takes’em away. Ain’t nothin’ gets left behind. All you see are the foundations of buildings. Forget trying to figure out where anyone’s house once was, you just can’t.You see things like the tiles from the entrances to houses and the bath areas, and just from that you can tell. Me too, y’know? That’s what I found and it was all I needed, I know my house like the back of my hand. That’s my house alright. Might be all that’s left. The main purpose of exhibiting debris is not just providing the opportunities for visitors to see the devastated materials. The main purpose is providing opportunities to imagine livelihood, daily lives of people using them before the disaster, or the feeling of disaster victims, through debris. The tsunami disaster made us realize that a lot of our memories, which were unconscious in peaceful daily life, in fact exist in various stuff around us. Stories on the postcards are created to illustrate various phenomenon, which is difficult to keep as the record. The stories are based on the “conversations related to debris and disaster” of the museum curator, the editor of this exhibition, who has been living in the community as one of the disaster victims during two years since the disaster. Based on the conversations with friends, acquaintances, and disaster victims whom the curator met at disaster sites, the stories were created as reflecting the curator’s own experience and contents of documents on local culture, which museum had accumulated, as well as regional characteristics. The stories created with the imagination do not have objective values as materials. 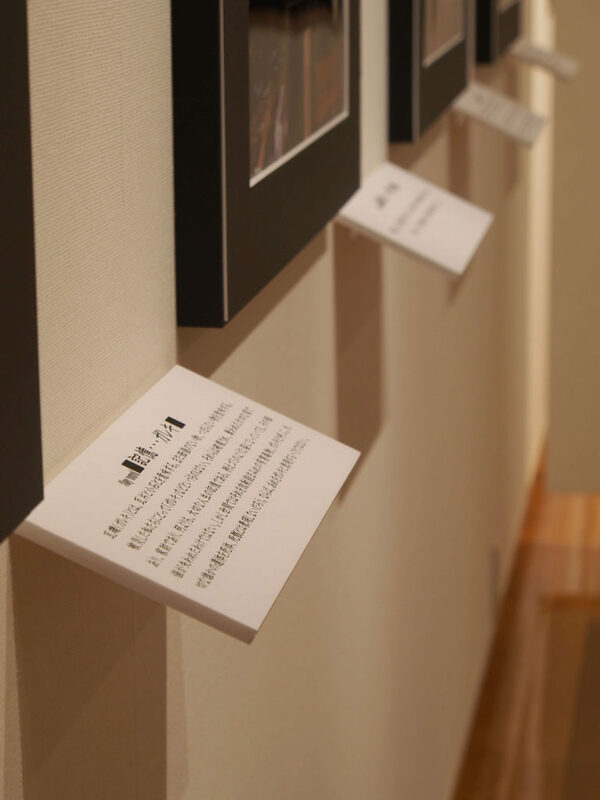 However, in the view of the circumstance that many visitors from outside of the disaster area after the disaster say “unimaginable”, the museum co-exhibit this stories as the material to support visitors to imagine with other recording materials. This is a rice cooker we bought around 1990. We lived with me, my husband, our two sons, our daughter, and the kids’ grandparents, totaling seven of us. We made sure the rice cooker could cook at least 8 cups of rice, but it still wasn’t enough. Now I just live with my husband. During Obon* and New Year’s the kids come back with the grandkids, so we still need a rice cooker that can cook us 8 cups worth of rice. Normally it’s just us two, but I cook 6 cups to last us through the day. 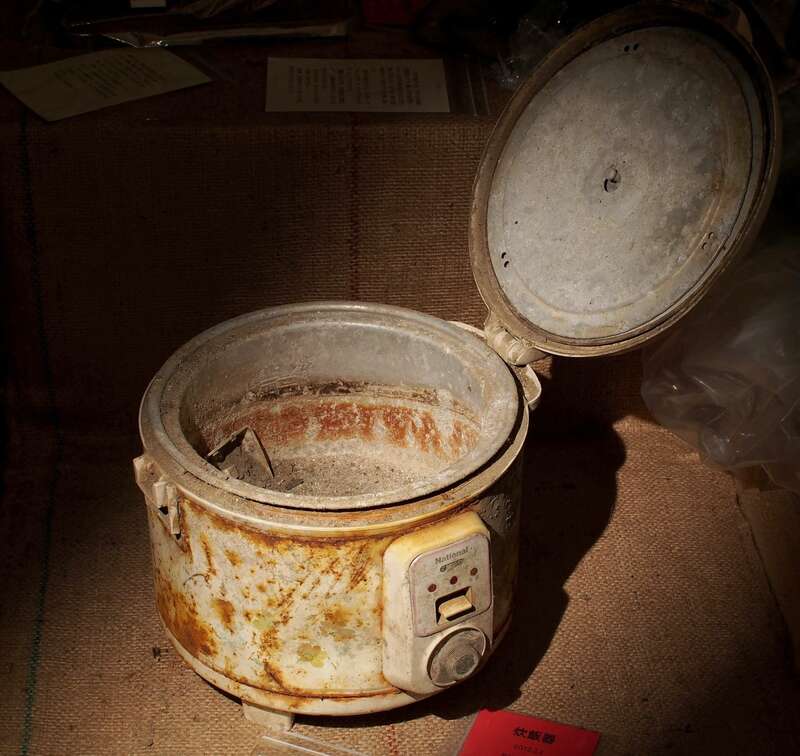 I found the rice cooker in the back of the bamboo grove of our house. When I opened it, there was nothing but a bunch of dark black sludge. I threw it out, and when I did, underneath the sludge there was white rice. That rice was supposed to be our dinner that night. I cried after seeing that. *Obon is a festival to honor one’s ancestors, held in August. During two years after East Japan Earthquake and Tsunami, we acquired various information and knowledge as a result of living in disaster-affected areas, and we also learned propositions and issues while conducting the survey and through the relationship with people from outside of disaster area. There was also uncomfortable feeling toward media, such as Television. We put up these concerns as “Keywords to Think about East Japan Earthquake and Tsunami”. 108 of them were placed side by side throughout exhibitions among other materials. They are materials to rethink the meaning of various words, which are used to discuss about the disaster. Materials and documents about Sanriku Tsunami in 1896, year of Meiji 29, and in 1933, year of Showa 8, and Chilean Tsunami in 1960, year of Showa 35, as well as materials about landfills and development before and after the World War Ⅱ are exhibited. There were facts of tsunami damages occurred about once in 40 years, in Sanriku Coast. Every time, the area is devastated. However, at the time of 2011, there were few local residents who were aware of the facts, and had concerns about that. March 11, 2011, since just after the disaster, people used the words “beyond expectation” and “unprecedented”. However, with these examples from the past, occurrence of huge tsunami supposed to be expected. Also, expression “unprecedented” is not a right way to use as the incidents were repeated in the past. 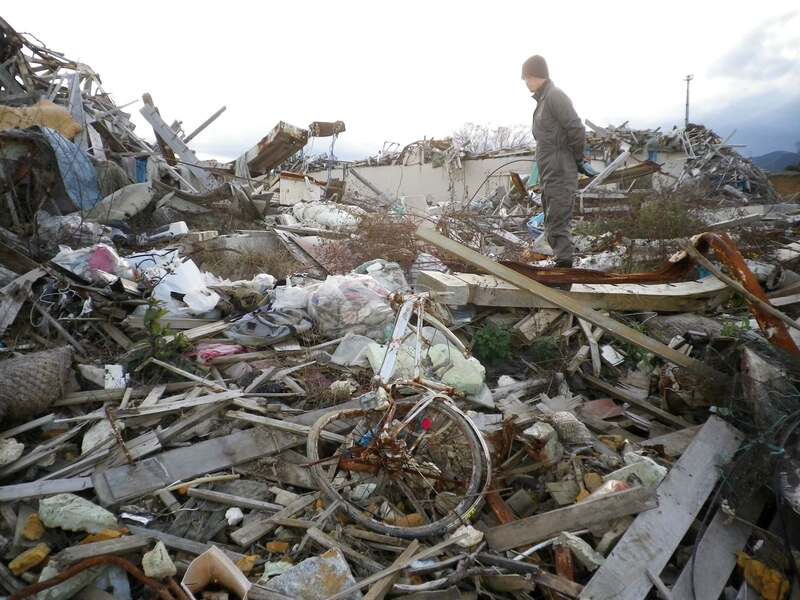 Most areas affected by flood and total devastation in Kesennuma City are landfilled after the War, which were developed during era of rapid economic growth. With the knowledge of local tsunami history, there was a possibility that we could have minimized the scale of damage. The museum thinks “to reflect on past experience is to think over future”. It is for sure that we cannot prevent occurrence of tsunami, but it is possible to change our ways to live. The museum believes that the only way to minimize the tsunami damages is to change human, in the other word, developing local culture itself. 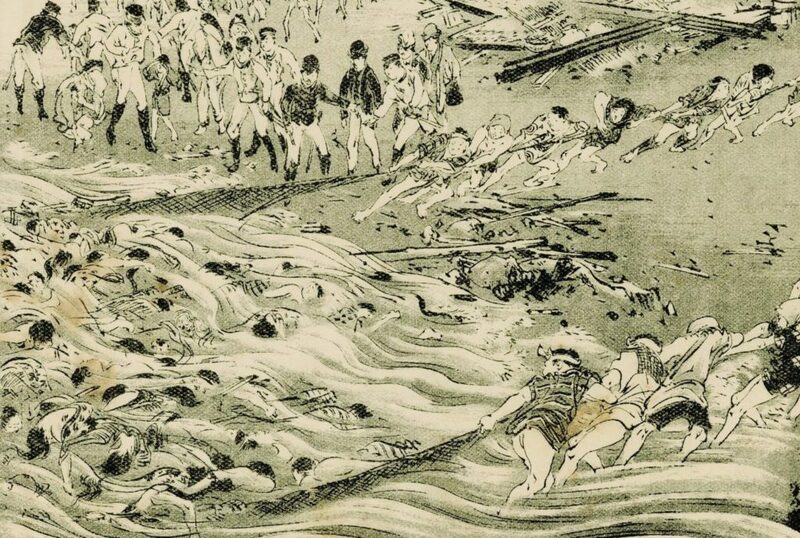 Illustration that people pulling up bodies by fishing net. 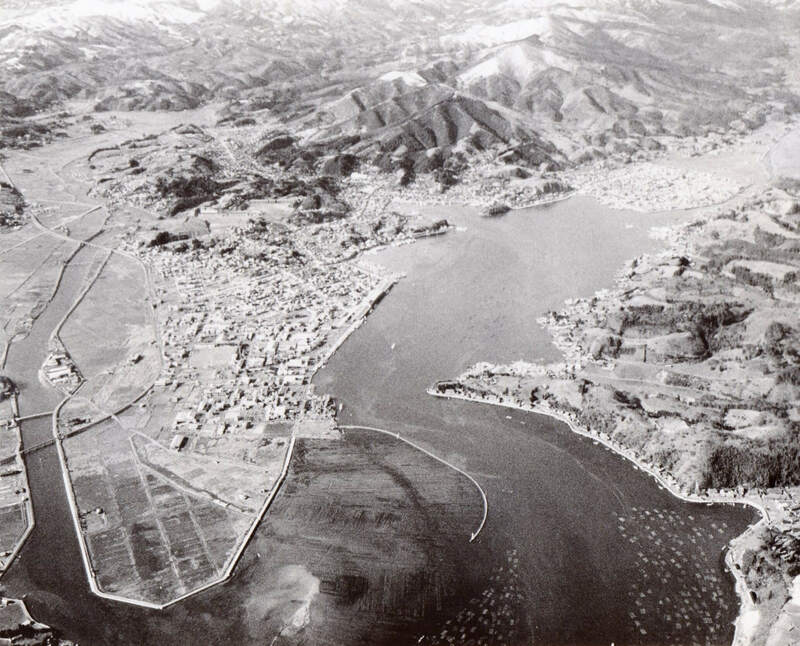 Around 1965, Naiwan area, Kesennuma City. Viewing Naiwan area from the open sea side. Left side, at the mouth of Ookawa River, reclamation land of Minami-Kesennuma area is developing. There is no heavy oil tank yet.